So the SUO Challenge this time is “Let if Snow”. WOW…what an EASY challenge! What I love about easy themes is that it is sooo easy to come up with something to go with it! When I was thinking about what to do, I decided I wanted to go with one of my very favorite (EVER) ‘color’ combos and do my snow card in white and silver and that is all! Yep…white…silver. you can’t go wrong! Stamp Joy, Peace, Love from Christmas Tagables set in Versamark and silver emboss. Layer Whisper White panel on the silver, wrap two pieces of Silver 1/8″ Ribbon around panel then add to card front using dimensionals. Stamp smallest and second to smallest snowflakes in Versamark and silver emboss. Cut out with the framelits. Cut out the smallest snowflake in silver glimmer. Layer snowflakes using dimensionals then add to card front using dimensionals. This entry was posted in Clean and Simple (CAS), SUO Challenge and tagged Christmas Tagables, Festive Flurry. Bookmark the permalink. Wow. I am loving this expression. Glad I bought the Festive Flurry bundle. Way to go Ms. Mary! Great job Mary! 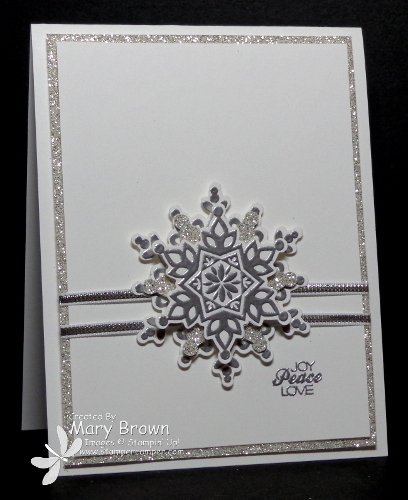 Love the silver and white together along with your gorgeous Festive Flurry snowflake- perfect for our challenge! Love your card! Have to ask….what do you use to attach the paper to the Glimmer paper? I’ve had the worse time, even resorting to Super Glue. HELP!